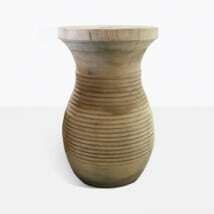 Although our smallest range of furniture, hard wood is also one of most charming materials. Mungar wood or swamp wood is a popular hardwood for its variation of color and distressed appearance making it perfect for a very modern look. Available only in our uber popular market umbrellas and the versatile and unique stools, hardwood is an attractive and simple product that we enjoy here at Teak Warehouse! Our market umbrellas have been a best seller for years and years, with a competitive price and many options of size and color, our customers just love these as an add on to their deep seating collection or dining table set! The hard wood stools are a great addition to a sofa or love seat, as a unique answer to a side table or even around a dining table as a daring and different approach to dining chairs! Hardwood is strong, but isn’t made for extreme exposure to the elements. We recommend the stools for sheltered areas or for indoors, and the umbrellas must be closed when not being used to preserve the integrity of the frame. 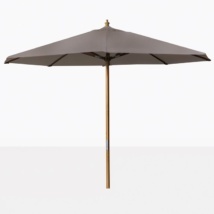 The market umbrellas, with the hardwood frame start at 7 feet and go all the way up to 11 feet! 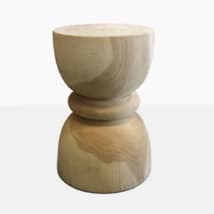 Our stools come in range of interesting and unique shapes. Whatever you choose, our sales staff are on hand 7 days a week to assist you with information, ideas and help finding the perfect item for your home, patio or garden. Teak Warehouse is the leading manufacturer of outdoor furniture in the USA, we are proud to bring you an incredible range of products, materials and style that all wear the customers seal of approval! Just look at our testimonials and the list of businesses and companies we have provided for proof! We are thrilled to work with you to get the best items to suit your taste, and your space! Call us today to discuss how one of our hardwood products can make an impact in your home!